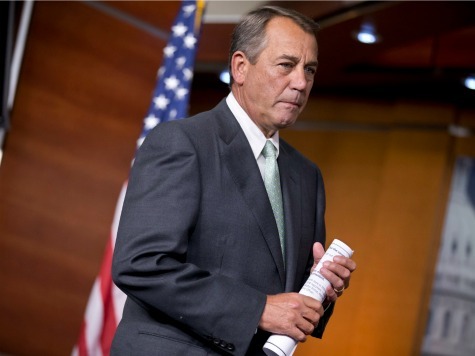 Let’s be honest: if he could, Speaker John Boehner would bring immigration reform to the House floor tomorrow. So while his announcement Thursday that he’s hitting the brakes on his push for a big immigration reform bill was a huge deal in the short-term, it doesn’t change the fundamental, underlying dynamics in the longer term. In his press conference, Boehner said amnesty efforts must take a back seat because President Barack Obama cannot be trusted to fairly enforce the nation’s laws. But Boehner hinted in his comments that such concerns could be resolved before President Obama leaves office after the 2016 elections, an opening those on the left immediately noticed. Sen. Chuck Schumer (D-NY), a member of the Senate’s immigration “Gang of Eight” and the Democrats’ most cunning immigration strategist, said Boehner’s comments mean nothing to him. Senate Majority Leader Harry Reid offered a slightly different reason. Reid told Breitbart News’ Kerry Picket on Thursday that he thinks Boehner backed off because, “[Minority Leader Mitch] McConnell threw a monkey wrench into it.” After Sens. Ted Cruz, Mike Lee, Jeff Sessions and John Cornyn came out in public opposition to Boehner’s immigration “principles,” McConnell did the same – a highly unusual move for the Kentucky Republican who takes pains to stay united with Boehner in public. Anti-amnesty activists fear the political climate could change in favor of immigration reform in the months to come. “Unfortunately since we know that since the Republican leadership wants to push amnesty by legalizing illegal aliens and increase competition for American workers, we can’t trust these declarations so we’re always on our guard,” anti-amnesty NumbersUSA director of government relations Rosemary Jenks told Breitbart News. “I wish it was over but the House leadership has shown propensity for changing positions with the wind,” Brooks added. “They have unanimously come out for amnesty for illegal aliens despite the tremendous economic damage done to America’s hardworking families. If they’re willing to do that, who’s to say they won’t flip flop sometime between now and the end of this session,” Brooks said. Brooks noted that Obama’s willingness to flout the law didn’t prevent Boehner from issuing the “principles” in the first place.